Fattoush is a salad with a twist, I guess. It's a lot of wholesome, raw veggie stuff served over or with toasted pita pieces. 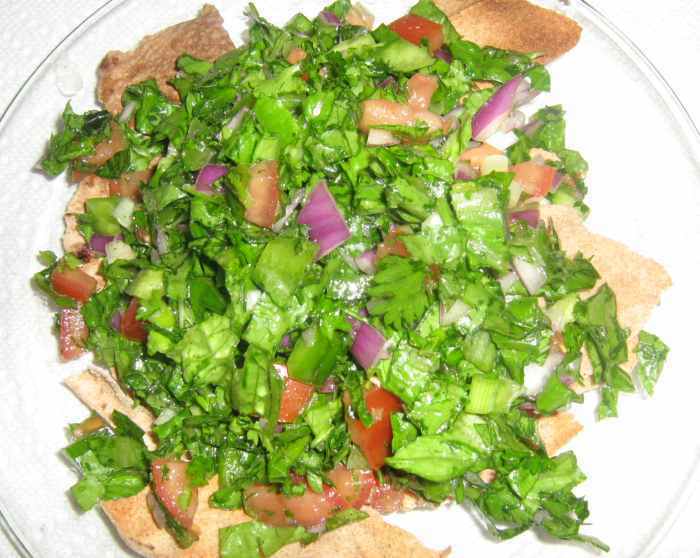 Well, the meaning of fattoush in Arabic is "crumbled bread". It also has several different spellings. It is a Lebanese dish and it has a terrific flavor. Like many middle-Eastern dishes it incorporates lots of fresh veggies as well as delicious herbs and other seasonings. This is a pretty quick fattoush recipe version that you can pull together without a whole lot of fuss. Instead of bread in the traditional sense, we used pita bread and broke it rather than actually crumbling it. We think you'll like it! Toast it under the broiler until it is lightly browned. Watch it closely as it will burn quickly. When it has cooled break it into large pieces. Combine all veggie ingredients in a large bowl. Drizzle the olive oil over the veggies and toss to coat. pour it over the veggies. Season with sea salt and pepper. Serve over the pita bread pieces.